I have been working on a pink Lincoln block since Friday. 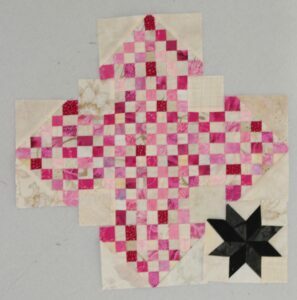 Today I am going to piece the other three LeMoyne stars and finish the block. Almost all of the pieces in the block are an unusual size, so a lot of time is spent with the cutting. These blocks are going to be set on-point with a 3-2-3-2-3 layout – 13 blocks. Since the goal is to make one block a month this will probably be a 2017 finish. Each monthly block will be sewn in the color picked by Angela at soscrappy. Today I also want to map out the design in the setting triangles and decide on the width of the sashing. It is going to be so fun seeing this quilt come together. It will look nothing like the quilt in the book – are you surprised? Linking up at Judy’s Design Wall Monday. This is beautiful! I love all of your pink fabrics. Thank you. It is so fun to see all the parts of the block come together.